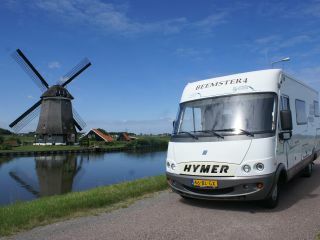 Nice neat and complete Hymer B544 integral camper with 5 berths, train seat and elongated comfortable sofa - 6 seats including 6 fully-fledged seatbelts and very comfortable driver and passenger seat. The driver's seat is to turn. 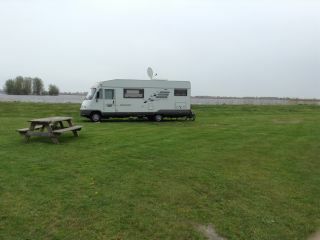 The camper has recently been fully inspected and everything works well. Motor in good condition and drives very nice. A lot of storage space, a kitchenette with fridge, three gas burners and a sink, a shower room with toilet and hand shower, on the back of a bicycle rack for 2 (Electric) bikes. A large awning over the entire width (possibly with side walls and front wall). The camper is child and dog friendly, both are allowed;) Smoking absolutely, this because of our small children. 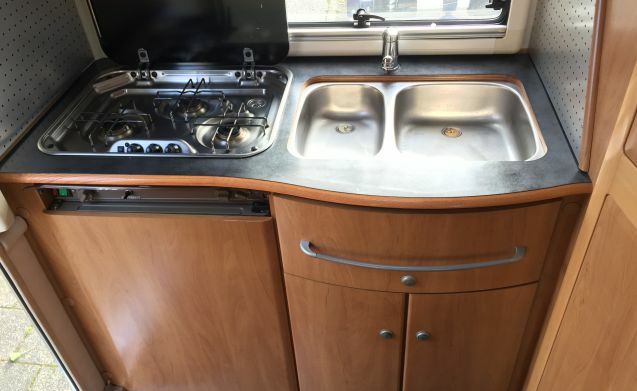 The camper is fully equipped, think of kitchen utensils, cleaning products, 4 chairs, outdoor table, groundsheet, sun screen, awning, wok for outside, TV for DVD playback, towels, bedding, games, optional baby bed, children's pool, etc. everything clean and fresh. In fact, all you have to do is take your clothes and your sunscreen with you and the adventure can begin! You can safely park your own car next to our house. Pick-up / delivery can also take place at other times in consultation. 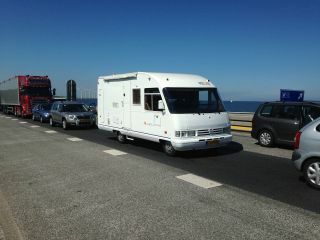 Outside the high season and holidays, it is possible to rent the RV for less than a week. Dogs allowed, do not smoke at all for small children. Response from Mark Bedankt voor de leuke en goede recensie. Ik ben zeer blij dat het naar je zin was. Super dat hij zo schoon en netjes terug kwam.